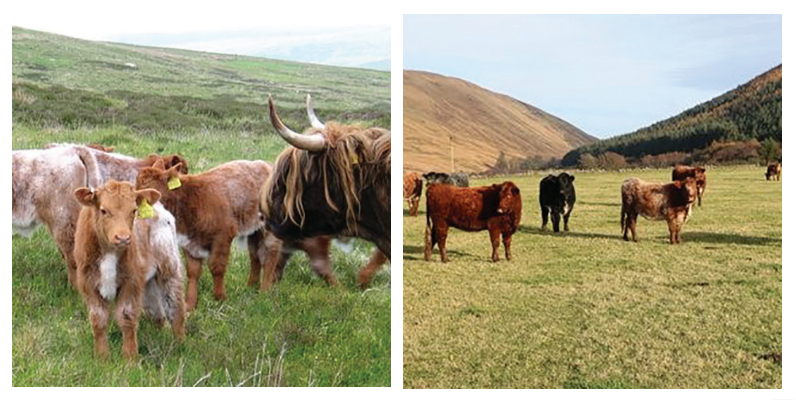 Husband and wife team Charlie and Jane McAllister, from Ceither Gaoithe Farm in Sliddery on the Isle of Arran are enjoying the benefits of their “easy care rearing system”. With 600 breeding ewes and 110 suckler cows the couple outwinter all livestock, with lambing and calving starting the first and last weeks in April respectively. “From the start of November we introduce round bale silage and top dress this with MEGAMINS Cattle, we also give the cattle and sheep access to ProPlus Complete Feed Licks to ensure 24 hour supplementation”. ProPlus Complete is a high energy feed tub containing 16% protein and a full complement of vitamins, minerals and trace elements that can be fed to both ewes and cows midgestation. MEGAMINS Cattle is perfect for balancing forage based diets and contains a full range of vitamins to supplement both youngstock and mature cows. “Before having our forage analysed we found it could be a bit hit or miss when it came to the spring time, the supplementation we were offering was not always ideal, meaning a few animals would lose body condition, ultimately resulting in some issues when it came to lambing and calving”. “Over the last few years we have introduced MEGASTART products to both ewes and cows in the 4-6 weeks prior to them giving birth. The last 2 years have been particularly pleasing as we have had no assisted calving’s and have almost completely eradicated the need to assist ewes at lambing”. “The MEGASTART, ProPlus and MEGAMINS products complement our system and breeding programme perfectly, it’s the balance of livestock genetics, stockmanship and the products that have all contributed to an overall improvement in animal health, performance and profitability”.